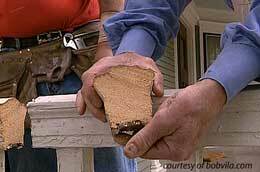 Bob Vila's old home renovation project is great for anyone considering renovating or updating their existing front porch. 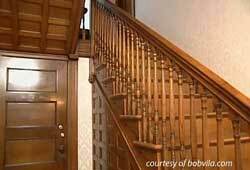 He walks you through the historic home renovation of an 1892 home that had once become a boarding house. 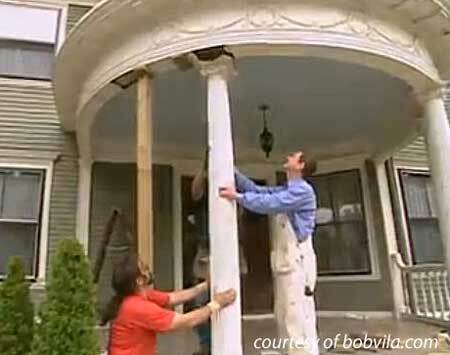 Bob explains the process of removing the balustrade (railings), porch decking, and inspecting the framing on this colonial revival front porch in the Elmwood district of Providence RI. Much of this content comes from a video that Bob had but is no longer available. This 1892 home has amazing oak moldings, built-ins, and an inspiring staircase but like many homes from that era, it has been neglected over the years. The central focus of this grand house is a front porch in desperate need of renovation. The porch decking is pressure treated lumber but should be made from mahogany to maintain authenticity. 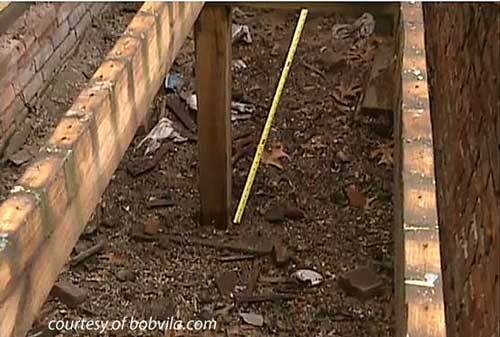 The top and bottom rails have also decayed to the point where the entire balustrade needs to be replaced. 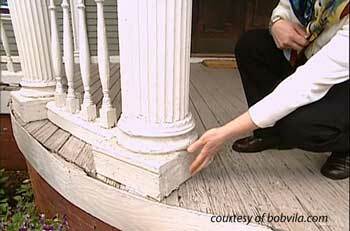 It appears the original column bases were replaced with pressure treated wood also. Demolition of the railings is the first step. Care must be taken, however, to ensure section profiles are recovered intact so they can be replicated for replacement. 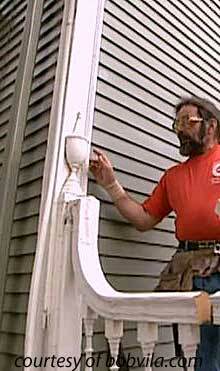 As you can see in the photos below, the railing section is beyond saving and must be replaced. Only one finial remains (photo at right) and was removed in two pieces. These, too, will be sent to the mill for replication. 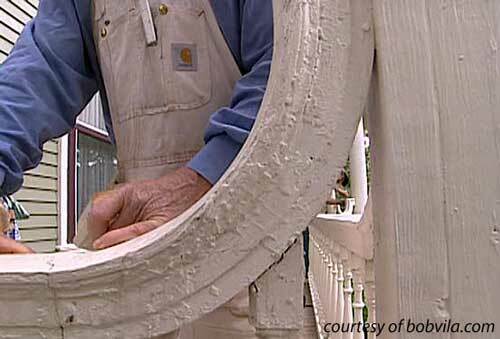 "Putty and paint makes the job what it ain't". 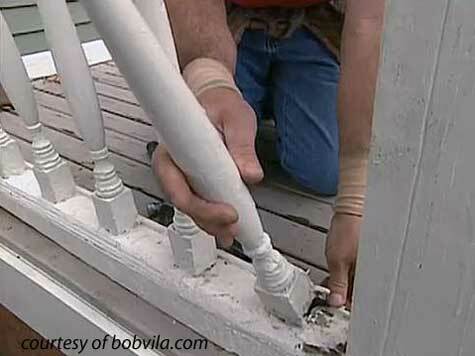 Several balusters (photo below) are removed to send to the mill works for replication and replacement. 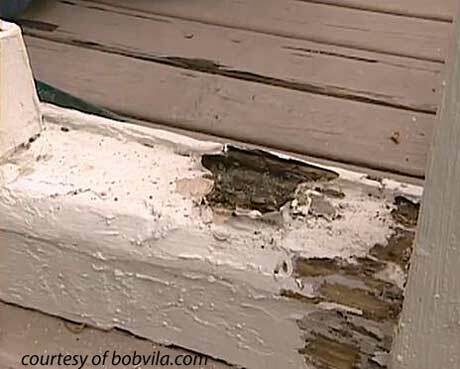 There are also obvious signs of rotting, lots of putty, and damage to the bottom rails as seen in the photo below. 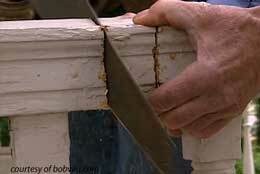 Most of the damage was caused by placing the bottom rail directly on the floor boards. 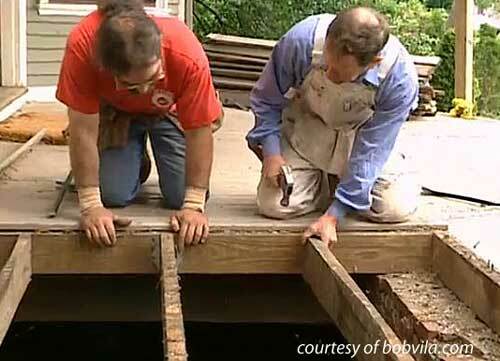 The bottom rails must be replaced and positioned off the floor to avoid water damage in the future. Once the pieces to be milled are saved, the remaining balustrade is removed as part of the old home renovation process - as depicted in the photo below. The next step is to jack up the roof so the porch columns can be removed for stripping and repair. 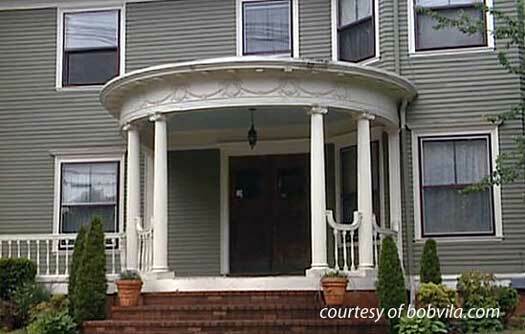 Note that the porch columns are solid with an opening through the center. 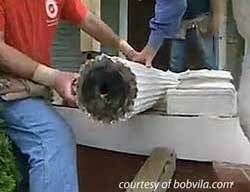 Without the hole for air flow, the columns would rot from the inside out. 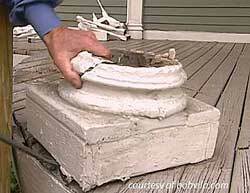 Column bases must also be replaced due to rotting and they are not structurally correct to carry the load. 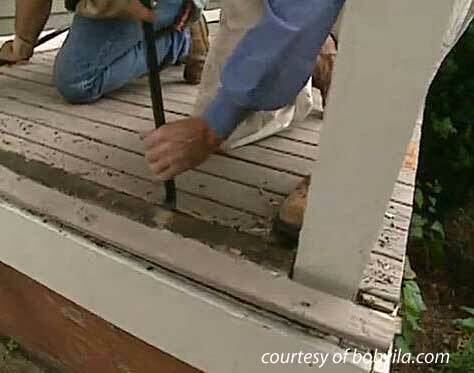 The existing porch decking is made from treated lumber and did not stand the test of time. Each board is removed to expose the framing underneath. It is extremely important to inspect the framing when conducting an old home renovation. It is noted that insufficient nails and joist hangars were used to construct the frame for this porch. This needs to be corrected before new decking is installed. 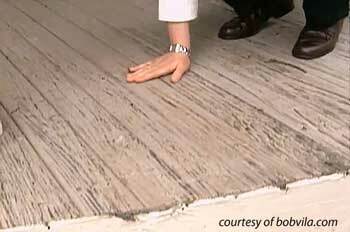 The porch flooring was supported by an inadequate span supported by a piece of wood on the ground. A new Sonotube footing needs to be poured and the framing needs to span the distance from the house to the outside foundation wall. 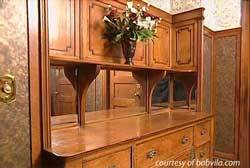 This concludes Part 1 of a four-part series of this Elmwood District old home renovation. 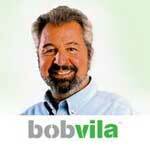 Bob Vila, the Dean of Home Renovation and Repair Advice, is well known for his television show "This Old House". Now you can access Bob's myriad tips and advice, ask questions and receive video responses, and catch up on the most innovative ideas for home improvement all through his website. 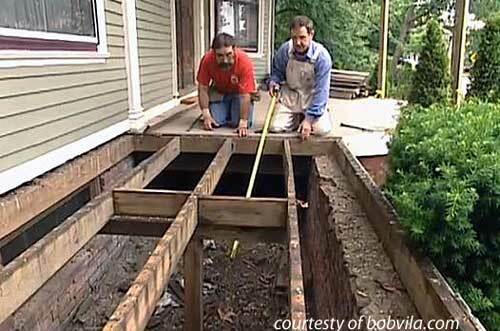 See more of Bob Vila's renovation of this wonderful home and other projects at bobvila.com. Disclaimer: The information provided here is for informational purposes only. Because every project is different and individual DIY skills vary, it's best to consult a licensed contractor about your specific project.